Every pre-war building should be automatically landmarked. Let the developers go to town with all of the dross we've built post-1945, filling in useless plazas and parking lots, and building infill at housing projects and other towers in the park. There's no excuse for what is happening on the Bowery with the Asian Pub building -- no 200-year-old Federal-style structure in this city should be in danger of demolition ... and yet the past 3-4 years have seen how many such structures turned to dust? How do you build a case for such a law that's constitutionally consistent with property rights? Why pre-war; because we have a handy phrase available? Why not pre-industrial revolution? ​The demolition on 35 Cooper Square has apparently been halted overnight. Full work stop notices appeared on the building site yesterday citing the site's failure to "safeguard public and property affected by construction operations." But when we called the Department of Buildings, they said "they didn't have that in their system." Seems to be some confusion here. Failure to safeguard public and property affected by construction operations. Defects noted: At the time of inspection there is no protection at lower roof of property. Site/roof is accessible by anyone by way of adjacent property 2nd floor bar area at 25 Cooper Square. Roof has been partially stripped to sheathing and in some places joists. Access is gained over small parapet divider between properties. Stop all work! Make site safe! Climbing from the Cooper Square Hotel bar into an abandoned construction site? Did someone really do that? Where do we sign up? Interestingly, though this official-looking notice has the phone number for the Department of Buildings on it, the Department of Buildings didn't seem to know anything was wrong with the site in the first place. We'll keep an eye across the street to see if anything's going on. LPC asleep at the switch. DOB asleep at the switch. No. 35 Cooper Square is a stark contrast to its neighbors. For decades a haunt of artists, it faces demolition. Cooper Square was an unnamed but thriving business district about 1825 when a descendant of Peter Stuyvesant, Nicholas William Stuyvesant, built what is now one of the oldest remaining Federal-style houses on the Bowery. In its day, the house, now known as 35 Cooper Square, was nestled among three similar dormer-roof structures. Today it resembles a pink mushroom, propped up against the towering glass and steel sequoia that is the Cooper Square Hotel. The Landmarks Preservation Commission has declined to award landmark status to 35 Cooper Square. The commission’s staff decided that because of changes to the exterior of the house, it no longer maintained its original character, and any attempt to recover that historical character would destroy the building’s brickwork. So, the brickwork is still there. Stucco can't be removed? And why is it necessary to remove it? It's part of its long history. This is a real estate decision, just like 2CC. As dusk settled over the East Village Tuesday night, Pete Hamill, the renowned journalist and author, stood by a window overlooking Cooper Square. Across the street, he saw a crowd lighting candles in front of 35 Cooper Square. Hamill grabbed his hat and coat and walked across the windy square to join several dozen people who were calling for No. 35 to be landmarked. Recently, preservationists were outraged when the city’s Landmarks Preservation Commission declined to designate the three-story 1825 structure. The commission ruled that the building’s facade had been altered when a brownstone coating was applied to the exterior, thus disqualifying it as being architecturally significant. As people shielded candles from the wind, David Mulkins, the chairperson of the Bowery Alliance of Neighbors, or BAN, led the call to arms. “The historic significance of this building is overwhelming. This is the oldest building on a New York City town square,” Mulkins said as people holding signs illuminated by flickering candles bunched together on the narrow sidewalk. “Abe Lincoln would have walked by this building on his way to make his anti-slavery speech in Cooper Union’s Great Hall,” Mulkins said, excoriating L.P.C.’s decision despite support from more than a dozen prominent preservation and community groups, architects and even a former L.P.C. commissioner. The oldest building in Cooper Square, No. 35 predates Cooper Union by 30 years. Residents have included such notables as author Claude Brown, actor Joel Grey and Beat poet Diane di Prima. A rally a month earlier was dominated by local elected officials. In contrast, Tuesday’s gathering was a veritable who’s who of local activists, preservationists and historians. “This really screams out, ‘Landmark!’” said Andrew Berman, executive director of the Greenwich Village Society for Historic Preservation. He pointed out that while about 3 percent of all city buildings are landmarked, in the East Village the figure is only 2 percent. Victor Papa of the Two Bridges Neighborhood Council found other culprits. “Bloomberg and the city seem to be serving the needs of the developers. We’ll lose this very valuable legacy that identifies the Bowery,” he said. “It’s another chunk of history that’s lost,” lamented Andrea Coyle of the Lower East Side History Project. Hamill didn’t seem to be speaking to the crowd as much as rubbing elbows with friends in a neighborhood bar. “The vandalism being done to this building is enough to make a person throw up. This is our inheritance,” Hamill said as he gestured toward the Federal-style building now partially hidden behind scaffolding. Recalling his early days at 309 E. Ninth St., Hamill waxed poetic. Some in the crowd passed out postcards addressed to L.P.C. Chairperson Robert Tierney, urging a public hearing. G.V.S.H.P.’s Berman said that at this late date, only the developer could save the building. Berman noted there has been some communication between both sides but nothing substantial enough yet to hang any hope on. East Village activist Barbara Caporale traces her ancestry back through several generations in the area. As of Wednesday morning, 1,641 people had signed a petition at http://boweryalliance.org/ calling on L.P.C. to designate 35 Cooper Square a landmark. ​Last week, we reported that the demolition of our across-the-street neighbor 35 Cooper Square had been halted due to a "failure to safeguard public and property affected by construction operations." However, we've received word today that it was simply an issue of acquiring, and paying for, the correct permits. According to the Department of Buildings, 35 Cooper Square was approved for demolition on February 14, yet was issued a "stop-work order" shortly after work began on the roof without permission. Before the site is able to begin further work or demolition, the DOB assured us that they first have to pay fees for the particular permits they've filed. After said permits are paid for, they'll have the green light to proceed forward with demolition. Sad. Last edited by Merry; February 25th, 2011 at 08:08 PM. Question (and forgive my lack of knowledge) .... What requirements if any are in place regarding the maitenance and upkeep of protected builidngs? For instance, the McGraw Hill building on 42nd is a beautiful structure, but it is run down, the tiled facade is literaly fallling off the building, and certain floors have had boarded up windows for years. I am not sure I understand the value of protecting buildings only to have them crumble because of lack of upkeep and maintenance. If an owner lets a designated building fall into disrepair to the extent that the fabric of the building is determined to be in danger then the LPC can force the owner to get things in order. But it's an arduous process and the LPC has little means of enforcement. Violations placed on a building by LPC can jam things up when an owner files at DOB for other work on the property, and this gives an incentive to the owner to keep things good with LPC. As we know by now, the 185-year-old 35 Cooper Square is about to be torn to the ground, and replaced by a giant futuristic hotel, or luxury condominiums, or a really swanky office building, or some such non-East Village-y thing. And as we know by now, a lot of longtime East Villagers aren’t happy about it, the destruction of the awe-inspiring, historical, super-significant ageless wonder that was the Asian Pub. Protestors picketed, petitions were signed, letters were mailed, and for naught. The capitalistic Man that is New York City prevailed. It’s a time for tears, right? Because as I said, I don’t know much about this neighborhood. I do know, though, that for years, 35 Cooper Square was little more than a place for broke NYU and Cooper Union kids to get really, really drunk. It was a lovely place, but not really historic. Where was the outcry then? The days of Diane di Prima living upstairs have long since passed. Over time, 35 Cooper Square evolved, from a residential haven for poets and writers, to – like it or not – a cheap watering hole. Over time, 35 Cooper Square’s become little more than an eyesore next to its surroundings. And somewhere over that time, 35 Cooper Square lost its history. ... I’m but 22 years old, only lived in the East Village for some eight months, and am more privy to this neighborhood’s prolific bar scene than its historic past ... for years, 35 Cooper Square was little more than a place for broke NYU and Cooper Union kids to get really, really drunk. It was a lovely place, but not really historic. 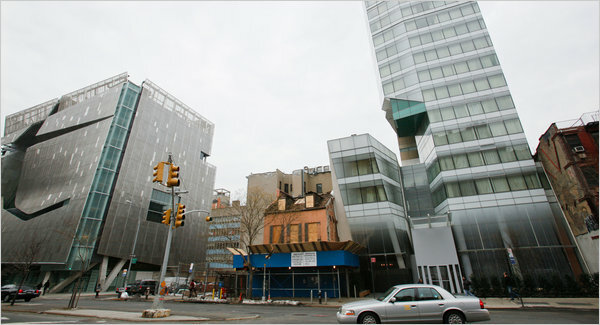 ... Over time, 35 Cooper Square’s become little more than an eyesore next to its surroundings. And somewhere over that time, 35 Cooper Square lost its history. This newbie doesn't have a clue about history. The fact that it's a federal-era house -- and not just a place where poets lived and students got drunk -- throughly escapes him. I was appalled when I read that article but did not comment. Let me do so now: what a little twerp.